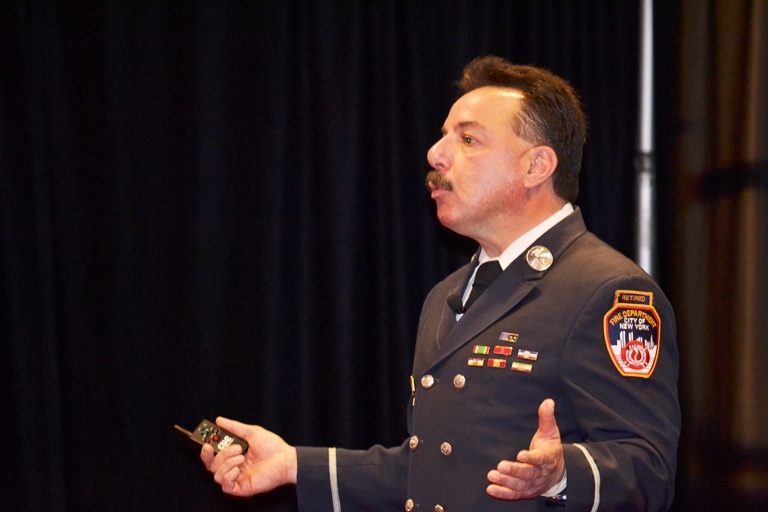 Retired New York Fire Lt. Joe Torrillo, who described his harrowing 9/11 experiences during the INA/ICMA convention. 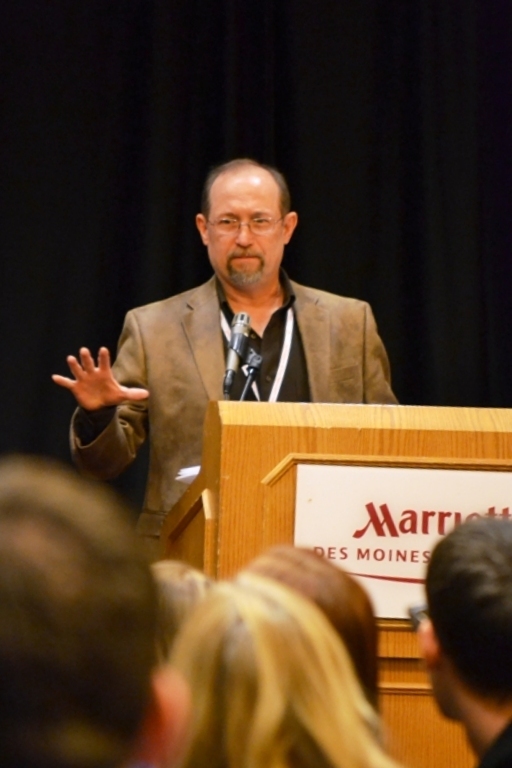 Unless I think of something else to say—and there is always that risk—I’m closing the door on the 2014 Iowa College Media Association convention, hosted by the Iowa Newspaper Association at its annual convention, which this final post. 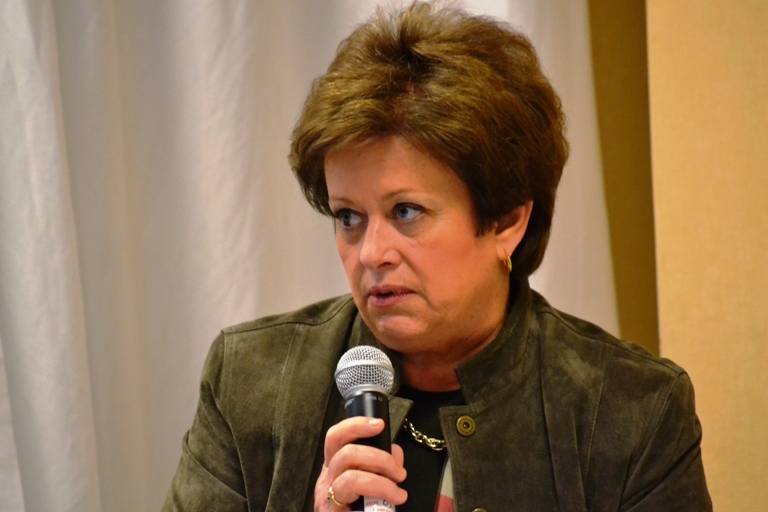 What was the good, the bad and the ugly of ICMA 2014? Thursday lunch, which was good. Sadly, I did not photograph my Zombie Burger. I was too hungry and it was attacked and consumed before cameras could be used. Just like a zombie would grab some brains. Good—All of the stuff I already wrote about, such as the Register tour, seeing candidates, etc. But, also: Discovering Zombie Burgers. In general, I ate well this convention—the Marriott has a good food service—but supper out Thursday night after winning 15 awards was grand, and cholesterol filled. I had something called the “Juan of the Dead” which featured slightly spicy chilies on top of some sort of fried cheese patty on top of two hamburgers and an inadequate and innocent bun. They warned me to cut it before eating, because the cheese bomb can explode. It was good advice. It was a great hamburger. The fries were perfect and I liked the dipping sauce, too. The networking lunch at the West End Architectural Salvage was fun, but the Zombie Burgers were a culinary highlight. Bad—Forgetting my credit card at Zombie Burgers. A quick, cold drive for no reason other than an aging memory. Luckily, our witty waiter had spotted the card and saved it for me. Ugly—Not much, really. The first few minutes in the MMU van were a bit cold. The traditional stop at the War Memorial was pretty silly. I don’t like Des Moines traffic, and leaving during the afternoon commute was a bit blah—but that’s not really ugly. Nothing was. It was a good convention. More Good–I also enjoyed the Friday kick-off speech by retired New York Fire Department Lt. Joe Torrillo. He has a good story, which he tells well. The speech was most powerful in the middle. The lead-in about his fire safety career was OK, but the story really took off when he got to his 9/11 experience. From his background, he understood how the World Trade Center was constructed, and within a few minutes of arriving at the scene, surmised that the towers would traumatically collapse. He succeeded in getting a triage area moved from the lobby of one of the towers, but left too late to leave himself and was buried in the first tower collapse. Found seriously injured but alive, he was placed on a boat in the Hudson River which was buried when the second tower collapsed. Yikes! Bad enough to have one tower fall on you—but both? For three days, because he was wearing another firefighter’s coat with the wrong name inside, his family was informed he was dead. Well, that made quite a story. Oddly, at the end of the speech, when he was making his pitch for all Americans to re-united, his message seemed to get away, a bit. Maybe I just was not sure what he wanted. It was a bit weird, too, that the chippy, clip-art like images at the end of the speech sort of pulled his punch, a bit. Still, if you ever get a chance to hear him speak, please do. He understands very well that he is representing more than 300 brothers who didn’t make it out of the buildings on that day, and his story is one that is very worth sharing. 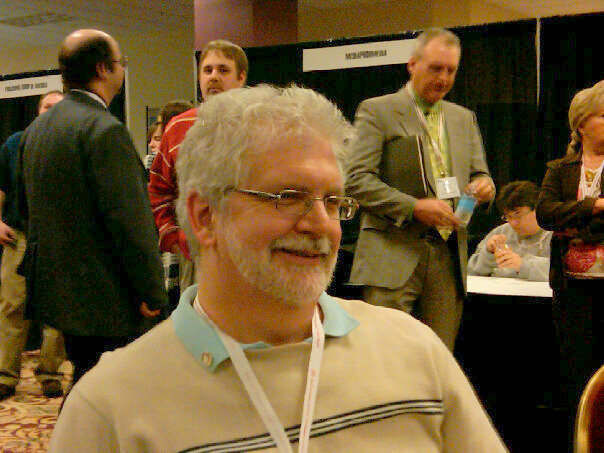 ICMA’s convention had many highlights for me. I liked all of the sessions. In fact, I missed the ICMA Young Professional’s panel, which I enjoy pretty much every year. So, INA, thank you very much, from this ICMA advisor. The 2014 convention was far more good than bad and ugly, and I appreciate your support. And, for one last time, congratulations staff of MMU Times. Next year—lets with 14 multimedia awards to go with our 14 newspaper awards, shall we? But, job well done. What Did I Learn About The State of Journalism? Ted Jackson speaks to ICMA awards ceremony. Most of what I write about is from his seminar presentation the next day.Ted Jackson, a great photographer, does not like oatmeal, one of my favorite breakfasts. Ted Jackson, a great photographer, does not like oatmeal, one of my favorite breakfasts. OK, I can understand oatmeal as a symbol of mundane. But add a bit of honey, some peanut butter, a bit of cinnamon, some walnuts and raisins, craisins or both—well, you’ve got crunchy, nutty good morning nutrition, satisfaction in a bowl. Photography is a bit like that, I suppose. It’s easy to do an average job of it, to take photos that show, as Jackson says, what things look like, but that don’t really compel a reaction or do well at telling a story. Aim for the rule of three. You’ve heard the rule of thirds. To Jackson, every photo should have three things that make it stand out. Subject, light, composition, the decisive moment, framing—not every image will have it all, and many have just two good points. A photo with three stands out. Work a little harder. If what you’re doing is easy, and you’re a professional story teller, you may not be doing it right. One of the other advisors, chatting after the session, noted that it’s the same with writing. If what you’re doing seems easy, you’re probably not doing it hard enough or paying enough attention. I was impressed at how Jackson pushed himself. He showed a picture of a Cajun in a boat, and to most photographers, it would be a very good image. But he played with shutter speed, the presence of light cutting through background trees and the instance when the man in the boat leaned back to take a deep breath—and voila, rather than settling for the very nice image, several snaps later Jackson had captured something extraordinary. I think it illustrates a point I make to students which Jackson didn’t state, but that was, I think, implicit in his work. One aspect that makes a great photojournalist is imagination. Not fiction—not creating that which doesn’t exist—but the ability to think of the different angle, to sense elements that could be framed—to imagine and then executive better photographs. 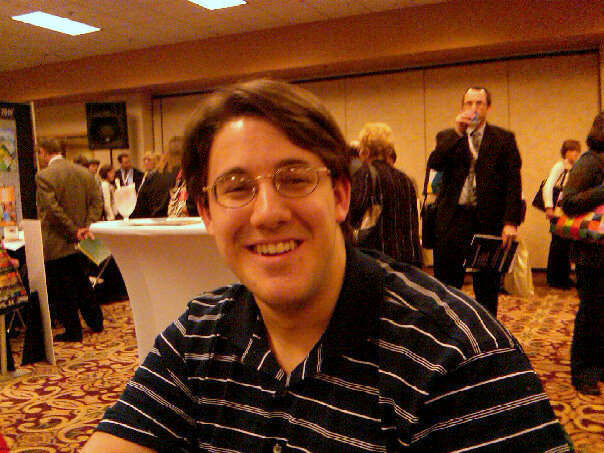 Jackson was a highlight of ICMA for me. But so was seeing the new newsroom of the Des Moines Register in an excellent tour led by Rick Green, Publisher. The newsroom is stunning. It’s a bit like a giant bridge from the star ship Enterprise, although instead of one screen as the focus of a great semicircle, it has a bank of nine to 12 screens. And the semicircle spreads out in row upon row. In the other directios, window looked east where the gold dome of the Capitol shone in the setting sun. Well, the main bridge of the star ship Register was exciting enough. 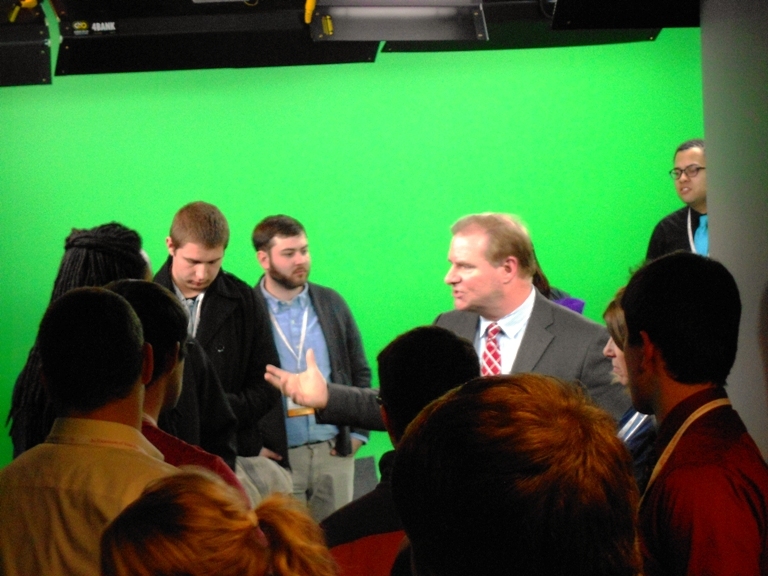 They also showed us a state-of-the-art TV studio, which made me almost salivate with envy. A less fancy version of this same room is something I’ve been lobbying for at MMU in recent years. No, we don’t need a full broadcast studio, but yes, we do need a room decently equipped for video production. Between communication, marketing and art, we have too many disciplines on campus that need a strong video component to not have this kind of room. Rick Green, publisher of the Des Moines Register, makes a point in the newspaper-web site’s video production studio room. Green noted that the Register has a deadline every minute of the day, and that it produces its newspaper out of its digital online news service, rather than the other way around. It left me thinking that we at MMU need to push much harder in that direction. Besides the visionaries—Jackson and Green—the ICMA convention included other interesting journalistic speakers. In particular, a former TV anchor and former governor’s press secretary, Courtney Greene, and former Register writer and Pulitzer-Prize winner, Jane Meisner, who now work together doing PR at AIB College of Business in Des Moines, described their careers and their paths from journalism to PR. Well, it’s a route may careers have taken. For our students, it’s important to note that any communication career has multiple twists and turns. Courtney Greene, former TV anchor. 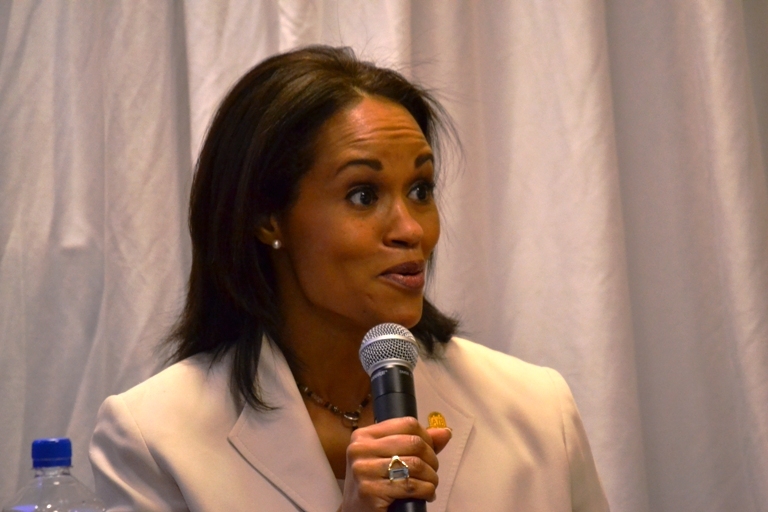 So what is my take away from the 2014 ICMA convention? For one thing, I’m not as pessimistic about the future of journalism or journalism education. There are bright new things happening, and there is room for new, creative people. For another, I’m more convinced than ever that today’s journalism education requires multiple platform talents—that journalists need to be at ease telling stories any way an audience wants them. That’s not a new idea to me, but it’s one that was emphasized at the conference. 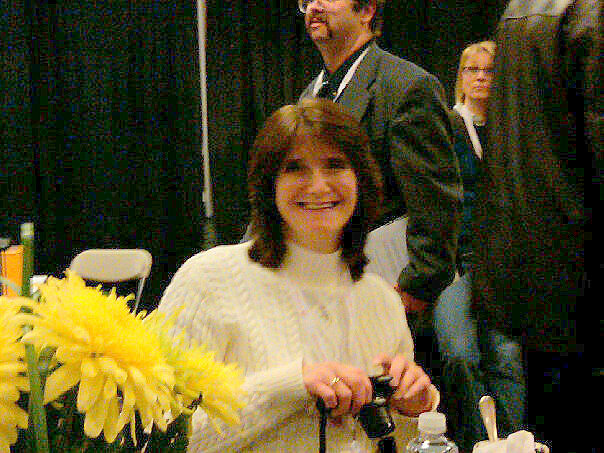 Pulitzer Prize winner Jane Meisner. Finally, you can be a great journalist and excellent story teller and still make fundamental errors. Like traducing oatmeal without realizing some in your audience come from Cedar Rapids, home of a major Quaker Oats processing mill. Well, you can’t win them all. And we still love you, Ted. 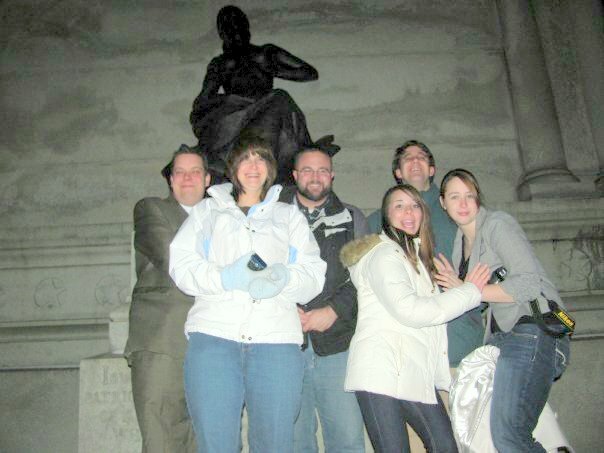 Erich, Cindy, Brian, Bizz, Bob and Mickena--2010 MMC Times ICMA travelers--with the war hooters girl at the Iowa State Capitol. I took the photo, but with one of their cameras. Note the photo. 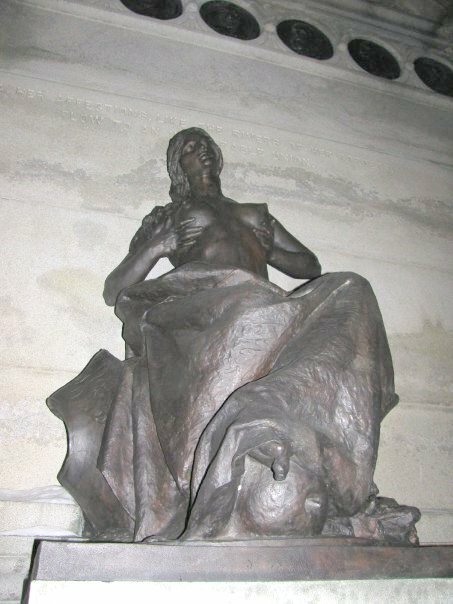 It’s not a tacky statue at an Iowa Casino, it’s part of a war monument adjacent to the Iowa Capital. 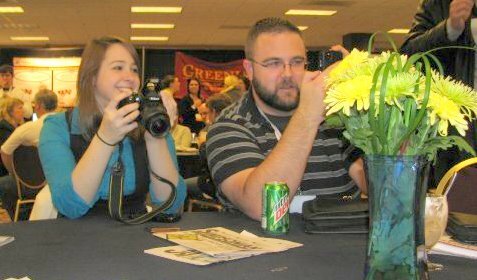 Anyway, as the group photo shows, it was one of the sights at the 2010 Iowa College Media Association Convention, attended by six Mount Mercy students and me Feb. 4 and 5. The “Mount Mercy Times,” student newspaper of Mount Mercy College, earned eight awards this year (nine if you count one our new news editor, Cindy, won for her Kirkwood journalism). Quite a haul that will cover more of our office “awards wall.” It is double our haul from last year, a respectable showing. I’m typing at home and the certificates are in my office, so I can’t list the awards here—but I’m sure we’ll post them on the newspaper (times.mtmercy.edu) and our Mount Mercy Times Facebook page soon. Bet John Ashcroft would cover this mama in blue curtains. Base of a war memorial at the Iowa Capitol. The awards put us third in the sweepstakes to be named best Iowa college newspaper of the year, a title won by Grandview University’s paper this year. The Loras College paper was second. Congratulations to both, hope we beat you next year :0. 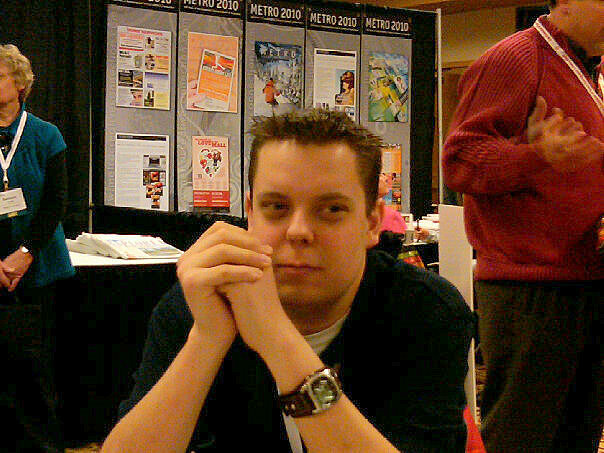 Third is out of 11 who entered contests, by the way, so it is a respectable showing. So, what were my impressions of the conference? Sweet potatoes are either inexpensive or elegant or both. 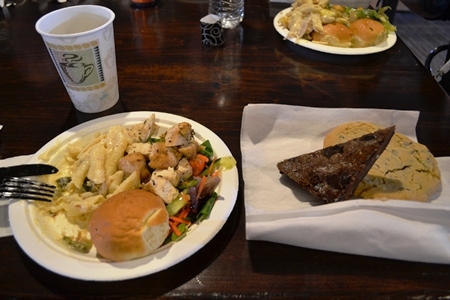 Every ‘fancy’ meal at ICMA featured sweet potatoes. What sweet potato-growing region is the chef at the Des Moines Marriott from? The giant tower of rust—a.k.a. the Ruan Center—does not grow more charming year by year. Some downtown Des Moines building are interesting, ones that appear to have been built in the 1920s or 1930s or earlier, with lions or sea horses incorporated into second or third flood motifs and that look like they have unique character from the skywalk. But what was the architect of the Ruan Center thinking? “Paint it? Hell no. In 30 years, all will admire its rust-belt reddish orange color and think, how cool.” Or, perhaps, how junkyard. In some ways, I wish Mount Mercy had undergone a growth spurt about 1937 or so—whatever buildings had been added would be slightly whimsical and feature buttresses or gargoyles. In architecture, at least, imagination for commercial or educational structures seems to have been shocked out of the world by World War II. The MMC Times is on a good trajectory. Three points to continue our awards growth: 1) Keep the basics going—good writing, particularly feature, opinion and sports writing—have to be emphasized. 2) Improve photography. We need news, sports and feature photos, as well as portfolios, to submit. And 3) Continue to jazz up the web. We were number two last year, did not get recognized this year even though our web master has done great upgrades. The standards on the web are changing quickly. We need more bling (and by bling I don’t just mean flash or sparkle, more substance, too). Anyway, as usual, it was an enjoyable trip. Thanks to the INA for hosting ICMA. Congratulations to all the Times staffers whose efforts helped earn this year’s awards. What is Bizz doing? Some lady (old and young, see background) sign language or exotic dance? Cindy is a new staff member, Kirkwood transfer. Got an award for one of her Kirkwood stories.